Many people operate with a basic attitude that God is silent. The scriptures – and particularly the Gospels- are God’s response to this problem. We cannot pretend that God is silent. What we do need to do is give the scriptures a place and space in our lives so we can ‘hear’ God. Below is a simple method that can help. All it takes is 30 minutes: 10 minutes reading, 10 minutes writing, 10 minutes sharing. In the future this site may have podcasts and video postings of the readings but for the moment check out the printable document to begin. Download the document from the front page. Begin writing what struck you. What did you hear? What is your response? Is there a new attitude, action, decision that you are invited to live? 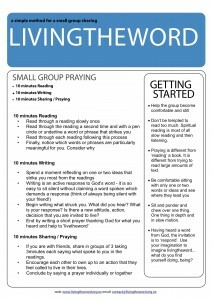 If you are with friends, share in groups of 3 taking 3minutes each saying what spoke to you in the readings. Encourage each other to own up to an action that they feel called to live in their lives. Spiritual Reading first steps in prayer obstacles in prayer.